Between the overactive heartbeat, anxiety, looming sense of fear over the unknown, fatigue, and all, as I write this I have been more susceptible than ever toward wanting to get numb. There’d be nothing more fantastic than just returning to some degree of normalcy, but that won’t happen for a while, so instead, I’ll ride these waves of insecurity through to safer shores. All I need to do is write something. Tomorrow will be better. This packing process is taking its toll. This won’t publish for two months or whatever so the results will be even more distinct now, but compared to a month or two ago, the clutter is nearly gone. I wasn’t able to catalog everything as thoroughly as I wanted, but when you have certain change agents in place, and when you commit yourself to them, life moves faster. I have yet to trash or recycle anything I’ve later regretted. This morning, as I worked up the courage to make the necessary steps that will have no doubt caused me to be in a certain predicament today. I hope it works out OK. I did the best I could to secure the brightest future for myself, but the level of anxiety it took for me to do that was far and beyond more stressful than any interview. Where will be living when this essay publishes? Today, thoughts of my sobriety date came to mind among other difficult emotions. “You have your birthday, and your sobriety date is like the day you were reborn,” was how the idea went in my head. I thought of all my sober buddies and supporters. I don’t really feel like drinking or anything like that. It’s not that bad. The terribly overwhelming emotions have subsided. Writing that introductory paragraph helped. Drawing that stupid picture helped. Listening to Andrew W.K.’s You’re Not Alone is helping. Let me be frank: disassociating from life and just focusing on writing this is probably the single most relaxing thing I could be doing right now. It’s just a stupid little update, but it’s helpful. It’s just me, you, and our thoughts about life. Springboarding off “The Feeling Of Being Alive,” living is the most difficult thing we do, but if we face our fears with a certain gusto, how will they hurt us? Well, when we relinquish power to various demons in life. Pity, self-doubt, and the biggest one: insobriety. For an evening, we feel nothing. These hurts no longer hurt. But then we don’t actually fix the problem. Now that I’ve faced this fear of mine with such an incredible force that it was more stunning than a perfectly-timed guitar solo, the ball is rolling, but this is the path I’ll need to go on. I didn’t choose to have issues with alcohol. I didn’t choose to have issues with compulsion, overmedicating, and anxieties toward living with stress. But I can choose, daily and hourly, to face these feelings. Anxiety, looming senses of fear, and victory. Inspirations: Having such an incredibly overwhelming sense of anxiety rot in my stomach. 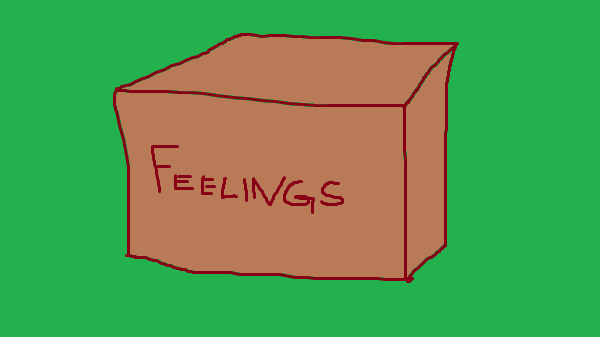 Picture: Put negative feelings in a box and address that stress when you have the strength. Until then, recover.